Maybe I’ve just been looking for them these days, but I couldn’t help but marvel at the swarm of hybrids on the roads these days, in particular the very popular and well known Toyota Prius. It seems like every car company is on a similar marketing blitz these days claiming, “we had the first hybrid” or “we have the best hybrid”. It’s hard to avoid the popularity of hybrids these days, especially in Seattle. Here’s my point. As one Prius driver zipped past me the other day, I noticed the bumper sporting a vanity license plate with the slogan “LESSOIL”. I cringed. Not only did I cringe, but I let out an exasperated huff of air and general weariness. I don’t think it was just because of my peevish dislike of vanity license plates. I want to reassure you here. I write for a green-living, environmentally conscious website. I’ve committed the past 5 odd years of my life to the study of and immersion into the world of environmental issues, policy, management, social movements, etc. 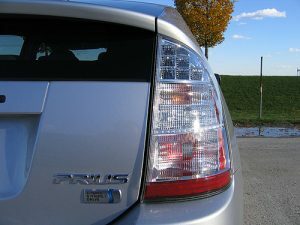 I love the fact that I am likely to see a Prius on my way to work or the grocery store. But still, there was something that was bothering me about the scenario. And it didn’t take long to realize what was at the root of my problem. Here’s the thing, environmentalism and green living values are starting to take hold in American culture. Obviously in some places more than others. But from what I’ve seen of my locality, public opinion and the culture formed around environmentalism is changing. Personally, I think for the better. But, and this is a big but, I’ve got to say this, please don’t be smug about it. No one, and I do mean no one, wants to be on the receiving end of an unsolicited holier than thou environmentalist rant, trust me I’ve been on both ends here. Environmentalism has enough of a bad rap, even this late in the game. For goodness sakes, don’t be that person out there adding to the bad PR. Driving a Prius doesn’t make you better than everyone else, it means you’ve made a decision to drive a car that consumes less oil. Congrats. Well done. I mean this sincerely. You deserve a sound pat on the back. It’s a step in the right direction, but by no means is it the be all end all of environmentalism. While it is important to recognize that there is a need for such “consumer friendly” options, the environmental issues and the movement as a whole goes much, much deeper than that. So don’t stop at the Prius. Keep digging. Keep learning. Keep changing your lives and your choices to become more environmentally minded. It’s in this way that we can influence our community, our politics, and our society, from the ground up. Now, people might get frustrated and find themselves asking, “when will it be enough?” The real answer is, probably never. There will always be new issues, new solutions, new innovations, new ideas. That’s one of the most exciting things about environmental issues, they are dynamic, complex and mercurial enough to keep even the most intelligent minds troubled. But don’t let that be a reason to give up. Humans are remarkably adaptable, and we see it every day. Don’t get bogged down in the despair, rather, be inspired and do something. Just don’t be a jerk about it. Hopefully that makes sense. I’ll wrap it up by saying this: if you really want to make an impact, then do it. There is so much that we can do on an individual level. Pick one. Even an easy one. Be proud of those actions too. But also be aware of the impact you have on the people around you. For goodness sakes, don’t make the environment an excuse to be off-putting. Don’t give people the reason to think the worse of you for acting environmentally responsible. One step forward, two steps back is not forward motion. Be happy in your actions, but don’t think that you’ve found the easy answer to balancing consumerism and environmentalism. Hate to break it to you, but there are no easy answers. That’s kind of the point. Also, just wanted to say you’ve got a great site here.